Plant this impressive specimen in your garden or patio container and enjoy a tropical feel all year long. 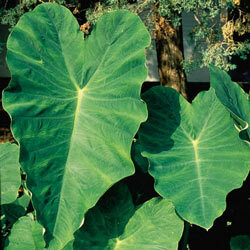 Huge, 18" wide leaves of deep green create a textural contrast in sunny spaces. Perfect as a container plant that can be moved indoors during the cool weather of late fall and winter. 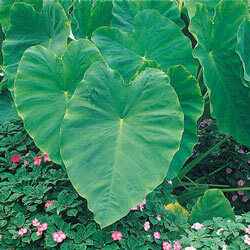 Foliage Type: Huge, oval, heart shaped to arrow shaped leaves up to 2'+ long and 18" wide. Flower Form: Small white spathes, like jack-in-the-pulpit flowers, insignificant. Planting Instructions: Plant 2 - 4" below soil level. Keep well watered. Best to mulch if not grown in standing water. Growth Rate: Fast, establishes quickly. Winter Care: Lift tubers in the fall and store in a frost-free location over winter. Replant the following spring after last frost. 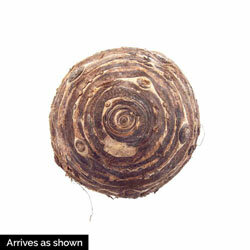 Additional Information: The taros replace the potato in tropical regions as a source of food known as 'poi'.